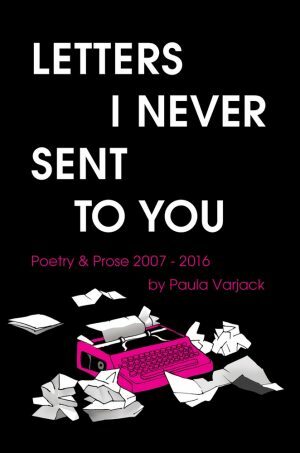 Fanning through Paula Varjack’s collection, Letters I Never Sent to You, two features imprint on the brain. The first is a photograph (the only one in the collection) of a clumsy heart mown into the lawn of the Berliner Dom. (“Sightseeing”.) The second is two words, shrieking in dirty great letters, “WE FUCKKKKKKED”. (“Brunch Date”.) These two visual explosions show in one flippant flick what the collection will go on to tell us if we care to listen: this book is born of repression. the answer is more likely to be the band than you. The above extract spills the collection’s heart: the Letters, spanning almost ten years of secret “damming”, have come out in floods. And yet, far from a complete exorcism from control, Varjack exerts a deceptively tight grip on this collection, retaining the claustrophobia of repression even through the catharsis of revelation. From the unnerving inversion of white and black on the jacket, to her stylistic play with bold type and white space, up to the careful poeticism of her free verse, Varjack steers us through her world while still holding the reins. this is my fault, he gave it to me and this is what I did. This is indeed what Varjack does. She takes everyday matters told to us in an everyday way, and, like diamonds from carbon, makes them sparkle under repression’s weight. She whispers to the wanderlust inside each life-trapped reader as she writes to us through her nomadic existence. Each section of the collection is named after a place, or an almost-place: “Berlin”, “London” and “The Departure Lounge” are most memorable, each one seeming to scream for reality and at the same time dart towards escape. This chaotic affair with travel reveals another of Varjack’s preoccupations: home. Born in Washington D.C. to a Ghanaian mother and English father, Varjack wrestles with race (“Commodity”), ethnicity (“My Country, Maybe You’ve Heard of it”) and language (“Maps, Translations”) in an effort to reconcile both her own identity and the very idea of identity. An intimate collection of short poems and prose, Letters I Never Sent to You is both frank and graceful in its interrogation of millennial repression and cultural dissonance. Told with salted candour, its snippet form and Cohen-esque lyricism give it a gritty texture which may just make poetry cool again. And the stars laughed and the night grew darker still. He stubbed out his cigarette and walked back in. with not so much as a word in my direction.